The main reason why we wanted to review PBJS12000R from PowerAll is his remarkable reputation. As we did research before even trying it and writing this review, we found many great opinions shared about this mini jump starter. Most of the reviews claim that PBJS12000R is No. 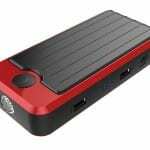 1 mini jump starter on the American market! This is definitely more than a good reason why we got this mini jump starter to review. One thing to notice on first sight is his pocket size and you ask yourself “how is possible to store such a huge capacity of 12,000 milliamps and boost the energy of up to 400 peak Amps inside this little thing!?”. And we will add one more thing – there are 2 more models who storage 16,000 and 32,000 milliamps! Really fantastic features especially if you know that it is actually a multi-function device and besides it can jump-start a car it can be used as a power bank. 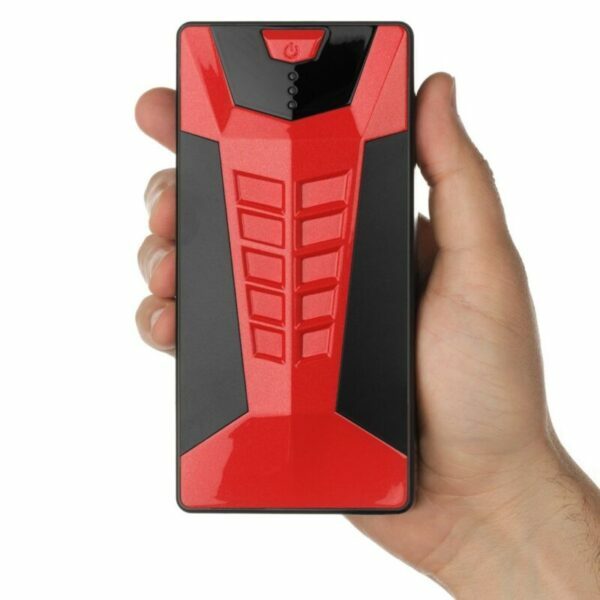 So, you can take it within your backpack and go for hiking or camping with no fear your cell phone or GoPro camera will stop working as a result of drained battery. Everything about this mini jump starter sounds absolutely wonderful, but let’s do some tests and see if it is all truth or a myth. 3 PowerAll PBJS12000R – 400 peak Amps in action! 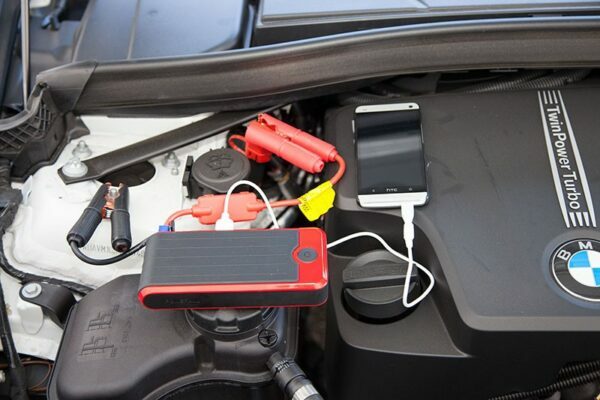 Most of us use massive jump starters to jump-start a car and the truth is we don’t like them as they are heavy and take up a lot of space inside your trunk. Especially we recommend this kind of jump starter for motorcycle owners as it easily fits under your seat. It is quite a relief knowing that there is a proper replacement who meets all your needs and plus it is multifunction device who can be used as a power bank for most of your electrical devices such as cell phones (Samsung, iPhone…), iPads and more. The unit itself is the size of a Smartphone. 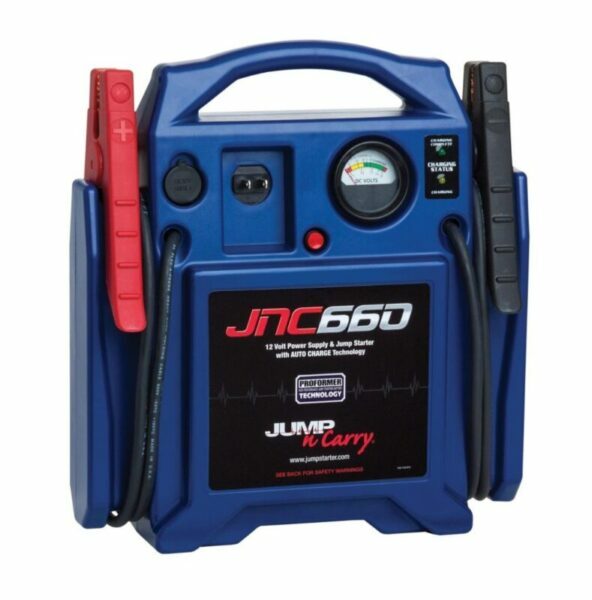 Very portable and definitely can be called pocket jump starter. 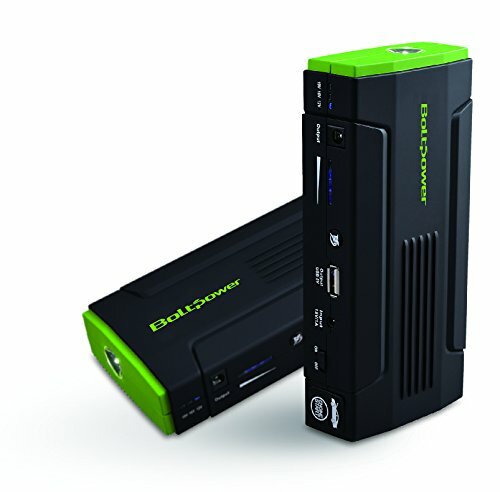 The really beautiful ergonomic design makes this mini jump starter recognizable and one of the smallest in a category. But be aware because some manufacturers try to copy this device and the quality of these copies is incomparably worse! We liked very much rounded edges and beautiful combination of plastic and rubber used as main construction materials for the housing of this PowerAll PBJS12000R unit. His ergonomic design makes it very easy to manipulate and it easily fits in every glove box. Rubber housing prevents damaging if you accidentally drop it while manipulating. As we mentioned it earlier PBJS12000R is multi-function device. It is three in one device. 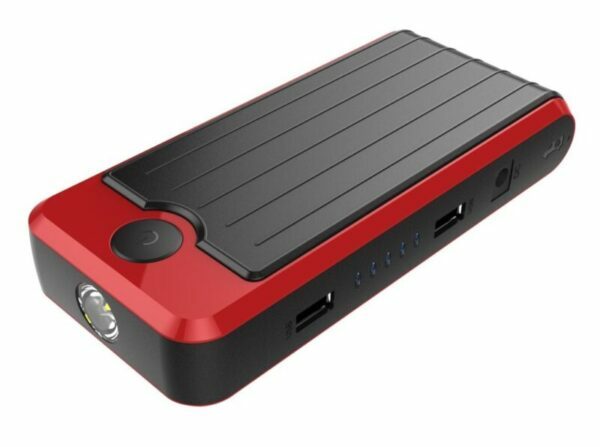 You get mini jump starter, portable power bank, and very bright LED flashlight. This Led lamp in front of the device is quite useful as it runs three modes including SOS flash (very useful in emergency situations and it can last up to 120h at full charge), Emergency strobe and Solid On. You may think this is an inessential addition but imagine the situation if you get stuck somewhere outside in the middle of a night and you don’t have a flashlight to help you solve problem… definitely, it is a great addition for emergency situations. On the side, there are two USB 2.1V ports that can be used to e.g. recharge two gadgets at the same time. As it is 2.1V output it recharges much faster than usual USB port. Also, this side contains receptacle where you are supposed to plug-in mini jumper cables included in this pack. Five blue led lamps indicate how charged is PowerAll from full (5 lights ON) to empty (no lights ON). All together PBJS12000R is quality made jump starter with some nice details. PowerAll PBJS12000R – 400 peak Amps in action! 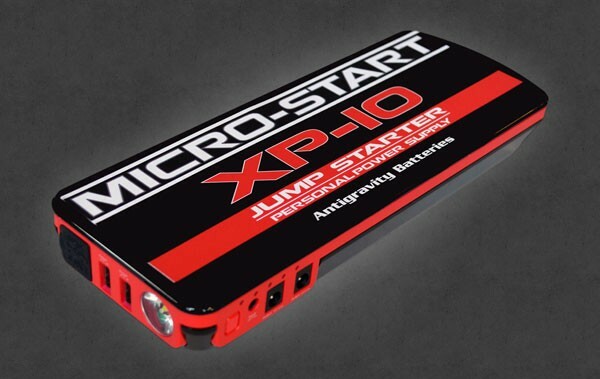 The battery inside this portable mini jump starter is based on lithium-ion technology. PBJS12000R has one battery inside containing 12.000 milliamps of capacity and 400 jump start Amps. What this means is it can jump start up to 4L gasoline vehicles and up to 3L diesel engines. It is quite a wide range covered by this type of jump starter. It’s been tested on a 3.5l V6 engine with a fully drained 12V battery. Before even trying to jump-start a car there are some things you should notice. First of all, you must be sure that your problem with starting the car is related to battery and not another mechanical issue. 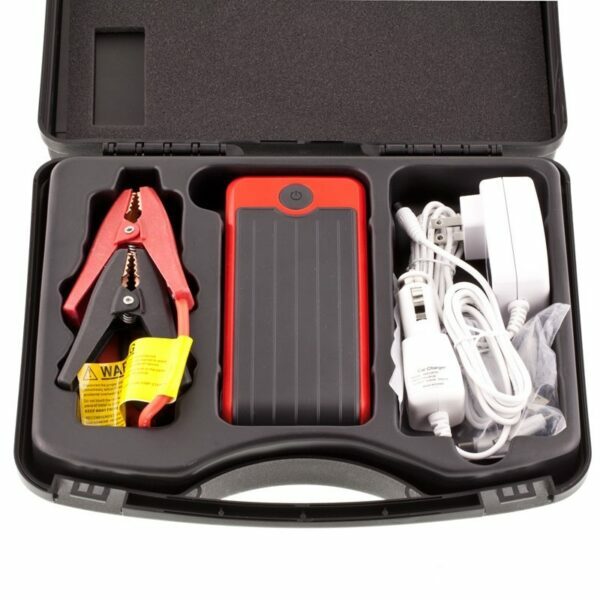 A second thing to be careful with is the way you will use this portable jump starter. What we actually mean is that you have to read carefully user manual which is included in PBJS12000R package. Even if you have some knowledge with jump-starting a car and have previous experience with similar devices it is recommended that you read user manual in order to prevent unpleasant situations which could happen as a result of improper handling. Check out our step by step guide “How to Jump Start a Car” in order to be sure you are doing it in the right way. Detachable clamps included in this pack are easy and safe to connect to the device. The procedure is quite simple as you just have to attach a positive clamp to positive pole on your car’s battery and negative on the negative pole. It is that simple. When everything was saddled we tried to start our 3.5l V6 engine and it started at once! No problem at all worked like a charm and stayed almost fully charged. With fully charged battery this mini jump starter can jump a car up to 20 times. After you start the engine it is highly recommended to disconnect clamps in order to prevent power feeding back to the unit as it will drain this mini jump starter. We have to say we were very satisfied with how PBJS12000R passed a test of jump-starting a car. 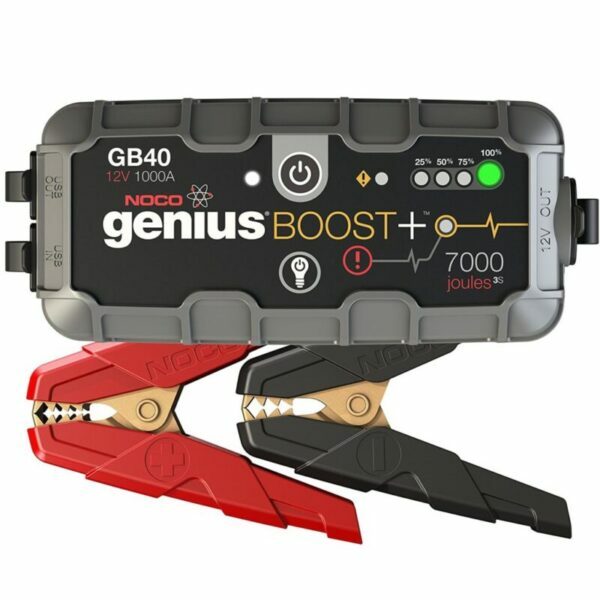 As we mentioned earlier this is a multi-function device what and besides jump starter it is also a power bank with 12.000 milliamps of capacity. So, having it in your backpack or a purse as you go for a trip or anywhere where you don’t have a power source is definitely a great choice. We used some of many different detachable tips you get within the case for charging a couple of smartphones (Note: want work for new iPhones as it comes with 30-pin variety) and it worked just fine. Funny thing is that we were on the road trip and when we have drained the PowerAll unit we just plagued it in lighters place in a car and in a couple of hours we had it fully charged for further use. All together this powerful mini jump starter proved himself in the best possible way. Like for any other device for this one too safety precautions are very important. PowerAll PBJS 12000R is buil of quality materials and advanced technology such as Overload protection, Voltage Feedback Protection, Reverse Polarity, and Spark Proof Protection and many other makes perfectly safe to use. Great rubber finish of housing prevents damaging unit as if you accidentally drop it while handling. No matter if you are a professional or an amateur with all these precautions there is no way that something could go wrong. You just have to read a short user guide and know how to jump-start a car and that’s it! In order to have a more precise review of this product, we did some research to find out what other customers who bought this product have to say. The truth is it is difficult and expensive to test this pocket jump starter in every possible situation. That is why this overall PBJS12000R review does not cover all aspects of quality but yet again it reveals many important facts everyone who should know about this product. 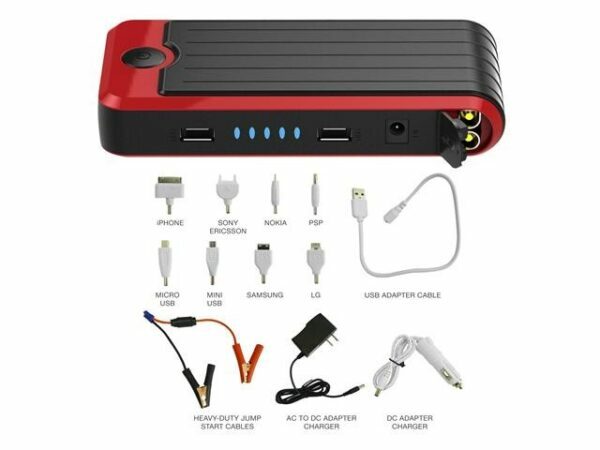 Most of the customers who bought this device are very satisfied it and use it without problems either for emergency jump starts or as a power bank for their electronics. Some customers claim it stopped working after some time. What could be the issue we don’t know as we didn’t have any problems. There is a possibility that the device was not used as it is recommended and that is why we constantly emphasize the importance of reading users guide. At the end of this overall review, we have only words of praise for this truly mini jump starter. We liked it from the first time we saw it as it came in the handy case among many different detachable tips. Beautifully design with rubber finish makes it ergonomic and easy to handle. So small it can fit your back pocket but yet so powerful it can jump-start a car. It’s been tested on 3.5l V6 engine with a fully drained battery and it worked with no problem. Reaching 400 peak Amps, PBJS12000R from PowerAll very is useful device either to jump-start a car or your motorcycle as it easily fits under your seat. Multi-function Ultra-bright flashlight is a great add-on for emergency situations. We used it as a power bank for iPad and cell phones and it also proved himself in the best possible way. What we liked very much is that it is possible to simultaneously recharge two devices. As an addition to our review, we did research of other customers opinions, reviews and complaints and what we found was again great feedback as most of these comments were quite positive. 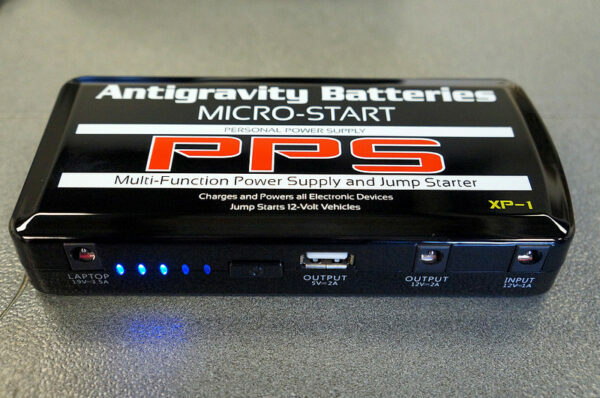 We are not surprised as in our test this pocket jump starter showed himself in the best possible way. However, it is not a perfect device. There are some things which could be better as for example quality of jumper clamps or maybe more compact and better-organized casing like the one of Micro Start XP-10. But all these shortcomings are just not good enough to deny so many great things PBJS12000R can do either as a jump starter or a power bank.